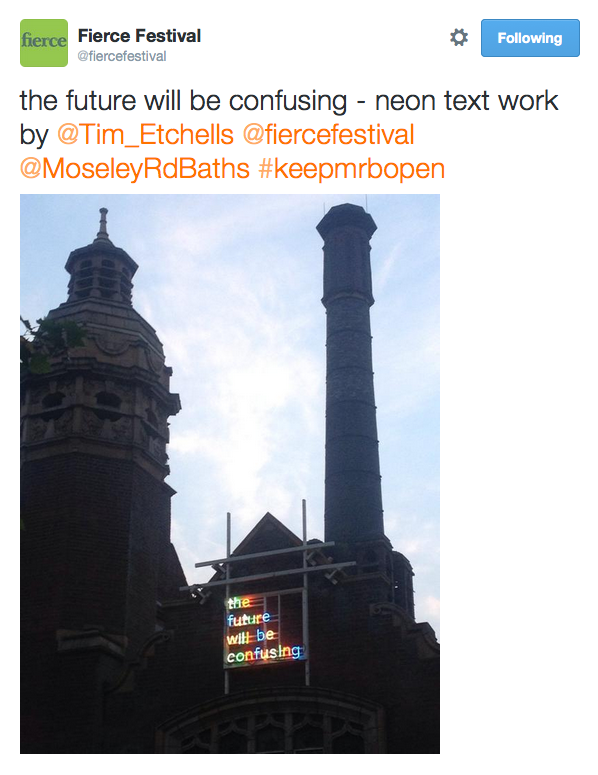 Many of you will have seen this neon text hanging from the facade of Moseley Road Baths. This is part of Fierce Festival’s ongoing residency at the Baths, following on from last month’s ‘Slip’ exhibition. Playing with the performative aspects of language and the dynamic relation between form and content, the phrase ‘the future will be confusing’ is spelled out in different coloured neon letters. Presented in a disorientating rhythm of colours, the words make an uneasy promise about the nature of the future before us… As with Etchells‘ other neon pieces, Will Be draws on the artists’ fascination with the speed, clarity and vividness with which language communicates narrative, image and ideas, and at the same time its amazing propensity to create a rich field of uncertainty and ambiguity. Tim Etchells is an artist and a writer based in the UK whose work shifts between performance, visual art and fiction. He has worked in a wide variety of contexts, notably as the leader of the world-renowned Sheffield-based performance group Forced Entertainment. www.timetchells.com www.forcedentertainment.com. ‘It’s a work by an internationally renowned theatre maker and visual artist called Tim Etchells. He has installed these ambivalent texts on contemporary and listed buildings all over the world. We felt the text would be appropriate because the future of the baths is indeed and remains uncertain.